Simply put, I just don't believe in any religious deity. I have no problem if you believe, but PLEASE be respectful of my own personal beliefs as I would be to yours. Your Bible says, "treat others the way you want to be treated." So, why don't you treat ME with respect? I am not coming down on you, telling you what to believe or what to stop believing in... Because those are YOUR beliefs. I don't live my life thinking about what happens once we die because there is so much more to life than just pondering on the unknown. You can believe ALL you want, just be TOLERANT and RESPECTFUL of MY beliefs in return. Is it that hard? Also, I will add that the more you keep telling me that I will "burn in hell for not believing in Jesus," the less respect I have for your beliefs. I am a sensitive person, so I get hurt a lot. That doesn't mean I am going to just start believing, no... However, all I am pleading is that you (kindly) leave me alone; I have meant no harm to you, nor do I intend on. Religion is supposed to make people betterWhy would I want to hurt your feelings? Just because I am no longer a believer in Christianity does not imply that "all I want to do is hurt the believers' feelings," because that is so not true... I am a loving person, and my personality comes from my own experiences and not some divine intervention, as much as the faithful loves to claim otherwise. No, I just don't believe in any of that. You may, however, say whatever you'd like about me or this writing. I don't care. All I require of you is simply TOLERANCE and RESPECT. Have I ever made it aware to you that the more you keep shoving down religious indoctrinations down my throat, the less respectful I am towards your religion? 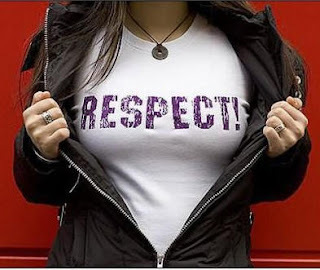 It's true; I will not respect anyone that fails to respect me. "Religion is supposed to make people better," they say. I haven't really seen that happen.